Catholic Charismatic Renewal , Bangalore, India. Karnataka Catholic Charismatic Renewal Services (KCRS), 67, Hutchins Road, Cooke Town, Bangalore 560 005. Phone: 91 080 5474844. In August of the year 1966, some lay Professors of the Duquesene University (pronounced as "do cain") attended the Congress of the Cursillo Movement. They were looking forward for a new experience and hoped to achieve the full power of Faith and wished to find it in this spiritual formation movement which had just started after the Vatican Council II in Spain. Then had come to this movement after having been frustrated in their search in liturgical ecumenical, apostolic and peace movements. At the Cursillo Congress, they got acquainted with Steve Clarke and Ralph Martin coordinators of student activities at St. John's Parish, East Lansing, Michigan. It all began for them with the reading of two books : "The Cross and the Switchblade" by David Wilkerson an autobiographical story of a Protestant pastor who was led by strong inner impulses to abandon the life of a salaried Parish Minister and embark on a dangerous mission to the delinquents and drug addicts of Brooklyn in neighborhoods into which the average American would not venture at night, or even by day for that matter. The 21 chapter of the book was "The Baptism of the Holy Spirit" which formed and penetrated the hearts of readers. And the Duquesene Professors found what they had been missing in other movements. At this time one of the organizers oaf the meeting was Ralph Keifer who came across a book on Pentecostalism by Joh Sherrils which was titles as "They speak in other tongues" which became the source book f&127;r those who had gathered for the meeting. IN the fall of the same year this group met again for a period of deeper prayer and in it "Come Holy Spirit" was recited and important place was given to the Holy Spirit. Since these Catholic laymen wanted more clarification on the topic some approached the Pentecostals despite of the somewhat repute of their doctrinal beliefs. W. Lewis an Episcopalian Priest put this group in touch with a woman involved in Charismatic Movement. In January 1967, an invitation was given to them to attend a prayer meeting on January 13th which was the day of the Baptism of Our Lord. At the meeting more anxious doubts arose at the way things were done. Ralph was confused by the prayer meeting. No doubt he was positive about the high level sharing and lively theology, but his intellectual mind was scandalized at the literal interpretation of the Scriptures and the idea of direct communication with God. Out of these four who attended the meeting only Ralph returned the following week but had brought with him another Professor of Theology, Patrick Bourgeois and at the end of the meeting the two men asked to receive the Baptism of the Holy Spirit. One group prayed on Ralph imposing their hands and the other group on Patrick. Ralph was asked to make an act of faith for the power of the Spirit to work. He prayed in tongues rather quickly. Ralph and the group began to have some deep and wonderful experiences of prayer. The result of all this was to seek an interdenominational and quite informal prayer group who had undergone the experience called "The baptism of the Holy Spirit" (the Acts of the Apostles and 1 Corinthians 12-14 were read literally by this group). The follow-up , was a weekend held for about twenty-five students. It was just an ordinary conference and discussions type retreat. On the 18th & 19th February 1967, they had gathered at Duquesene University, but what they did differently was the group concentrated on Acts 1-4, and were expecting the coming of the Holy Spirit, and before each conference sang the "Veni Creator Spiritus" and meant it. They all experienced different feelings and were surely touched by the Holy Spirit. They prayed in tongues, and felt more and more to spend time in prayer, real deep soaking prayer, and were rewarded by an inner peace that only the filling of the Holy Spirit can bring. They all experienced miracles in different forms shown to them and they now really felt that the calling of God was real and more than only in that room. During retreats many people turned over new lives, things happened that strengthened their belief day by day. Paul Gray and Patty Gallagher were some of those who were very vocal about their experiences, besides Ralph Keifer. The earlier charismatics were of a interdenominational setup and the streamlining and growing frequency and intensity of this charismatic outbreaks led to the appearance at the beginning of the Centuary of a movement which became strong that it developed into a new and independent denomination within Christianity known as Pentecostalism. The early movement is spoken about by people like Agnes Ozman and Edward O'Connors, later day figures many will known speakers like David du Plessis who was even invited to Vatican Council II as an observer. Notre Dame University in South Bend, Indiana became a famous place for the new charismatics in September 1967, and students soon were rubbing shoulder to shoulder with thousand of participants from a number of Nations and Bishops and priests soon joined up the annual conferences. In May 1968 the first national leaders conference at Ann Arbour, Michigan about 150 people turned up, in the beginning of 1969 there were about 450 for the conference, 1971 there were 500 and the movement spread inleaps and bounds, and the attendance steadily came up. A stenciled Pastoral Newsletter for leaders in the movement was begun in Michigan I May 1969. In June 1970 it became an eight page printed publication, which climbed to a circulation of 1200 in the US and abroad. It was renamed New Covenant in July 1971, and it continues today with an ever increasing circulation and 64 page publication. Minoo Engineer, a young Parsi civil engineer who while studying at Fordham University in the U.S.A. became a Catholic through his involvement with Charismatics. It was he who typically brought the Catholics Charismatic Renewal to India in 1972. Incidentally, the same year two Jesuits, Fr. Fuster ad Fr. Bertie Phillips who had been to the United States for studies and research returned. The first prayer group was held on Mondays in the evenings in Bombay (Mumbai). There were only four members present, Fr. Fio Mascarenhas s.j., Sister Olga, Minoo and Luz Maria Engineer. It soon spread to Bandra with a lot of encouragement from the Medical Mission Sisters of the Holy Family Hospital. It started growing and the biggest group was at St. Andrew's which was let very ably by Terence and Beryl Fonn and Sr. Bernadine. Another group soon started in St., Teresa's Parish. Minoo lived in Vile Parle and started a group in Dilkush Convent at Juhu only to move soon to the Parish of Juhu. Small groups were formed and started in private homes, the Asha Colony in Juhu Tara and in the Royal Hotel. Four groups were formed in Byculla beginning in the Institute of the Deaf Mutes in Mazagoan. There was a very active group in Mahim in the Presentation Convent with Sr. Basil and Margare D'souza. Fr. Fuster and Fr. Phillips started the Life in the Spirit Seminars and prayer groups were well attended around by 60 members. Prayer meetings were held at St. Xavier's College under Fr. Fuster's leadership. The Renewal spread to Poona ( now called Pune) and to Goa. Then to Gauhati (Assam) where the Renewal started in the Air Force Colony as an inter denominational Prayer Group. Later to Delhi and prayer groups functioned at St. Thomas Paris and St. Dominic's Parish. In such ways small groups spread to all corners of India. It was way back in 1974 -75 when the Charismatic Renewal in the country of India was very young and growing and the Holy Spirit was moving and renewing people every day, that a group of 30 leaders in Bombay were invited to attend a day of recollection at Seva Niketan Byculla, Bombay (Mumbai). There were four important decisions taken at the end of the day. A Discerning Body: It does this act by keeping in touch with all the expressions of the Catholic Charismatic Renewal in the Country, the NST helps it discern and follow God's plan. A Prophetic Body: The NST is called upon to lead the people in the Catholic Charismatic Renewal to grow in holiness. It does this by helping to encourage, guide, admonish and thus build up the Body of Christ which is the Church through the use of the special charisms of the Holy Spirit. A Servant Body: The NST is a body of servant leaders chosen from amoung those involved in the Catholic Charismatic Renewal to carry out those services and functions necessary for the orderly growth of the renewal. In these threefold roles, the NST is always in submission to the apostolic tradition in the church as represented by the Pope, the Catholic Bishops Conference of India and the local Ordinary. The Catholic Charismatic Renewal is related to the Commission for Christian Life of the CBCI and its Chairman is a member of the Commission for Christian Life. Is to plan develop and organise periodical national conventions, conferences and seminars so as o make them affective instruments of growth as well as witness to the Lordship of Jesus on the whole Church. It is to work with the regional leaders in planning and organizing Regional Conventions, conferences and seminars. Is the official magazine of the Catholic Charismatic Renewal which is published by the NST. Which is sort to provide suitable literature for the growth of the Renewal. In order to undertake the supervision of the contents of these productions. Provisions of teachers and preachers, etc. In order to provide the resource personal for preaching and teaching and other Ministries whose gifts have been discerned and found genuine. The National Service Team consists of the following members. Chairman, Vice-Chairpersons, Episcopal Member, ex-officio members ( Director of the National Office, Editor of : Charisindia, immediate past Chairman, Chairperson, National Youth Pastoral Team). It is a representative body of servant leaders set up to assist the NST in service the Charismatic Renewal by offering discernment and advice to the NST on the initiatives and services it offers. This helps to spread the National vision of the Catholic Charismatic Renewal. NAC also helps to spread as channels of communication between the Renewal and local Bishops, Diocese and Parishes etc. In general the relationship between the NST and NAC is one of unity, support and cooperation as part of one Body of Christ the Church. To encourage the integration of the Catholic Charismatic Renewal vision, i.e. Basic Christian Renewal at all levels with the renewing processes of the Church especially with regard to pastoral and evangelization programmes. It forms the official channel of communications with the International Catholic Charismatic Renewal Office (ICCRO), Rome to share with it the pastoral vision of the Indian situation, to receive in exchange the fruits if ICCRO's International insights and to support their programmes where possible. The advent of the Catholic Charismatic Renewal Movement to India and its spreading to various cities and regions have plenty of things t signify to us. Now when there is a concerted and systematic effort to return to our sources. Today the core of the Indian spirituality is interiority or deep experience of the spirit, the spirit who swells in our hearts and premeates all reality. As the Catholic Charismatic Renewal has entered with the Spirit, and to a Spirit conscious people at a time when the Church in India wants seriously to incarnate and integrate herself in the culture and the religious heritage of the country by an all around and systematic promotion of inculturation especially in spirituality and prayer. Then there should be a special significance in this event. The Catholic Charismatic Renewal has been given the task of making the Church aware of the fact that it is a Spirit Community, and the Church has to be the Church of the Spirit of Jesus Christ only then it will be effective as the Light of the Nations. The Diocese of Bangalore was formerly part of the Mysore Mission. It was erected into a Vicariate in 1850 and after separation from Pondicherry in 1866, when the Hierarchy in India was established by the Bull "Humanae Salutis Auctor" Mysore became a Diocese with Bangalore as headquarters. This Diocese was bifurcated and thus the Diocese of Bangalore as such was erected on the 13th February 1940. It became an Archdiocese on 19th September 1953. The Patron of the Archdiocese is St. Francis Xavier. It covers an area of over 38,000 sq. kms. The Languages spoken here are Kannada, Tamil, English, Telugu, Malayalam, Hindi and Konkani. The Founder of the Renewal in Bangalore was a Jesuit Priest, and Principal of St. Joseph's College of Commerce, Bangalore later Principal of St. Joseph's College, Jakhama, Kohima-Nagaland, the Rev. Fr. Francis Rebello, PhL, STL, MA, Phd (U.S.A.). Although Fr. 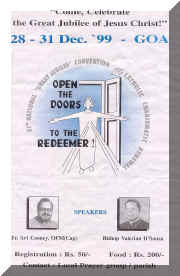 Rebello was in America in 1967, he did not come into contact with the Charismatic Renewal then. In a Parish where he worked there was a family whom he knew, the parents used to ask Fr. Rebello to pray for their son to become a priest and their daughter a nun. The boy joined the Franciscan Seminary in 1968 and was in constant correspondence with Fr. Rebello. In 1971 he wrote to Fr. Rebello saying that he was in the Charismatic renewal and it was so wonderful. It was the first seed which was sown. Fr. Rebello wrote to the boy asking for more details about the Renewal. The bow made arrangements with the International Centre of the Charismatic Movement to send Fr. Rebello some literature, and the sent him plenty if literature and also gave the address of a lady from Canada, working at Asha Niketan, who was initiated into the Charismatic Renewal when she was in the United States. Fr. Rebello met her and the first Charismatic prayer was done together in Bangalore. Soon after, Fr. Fuster s.j. who had been to the United States for his Post-Doctoral studies came back to India and visited Bangalore to give some course. Fr. Rebello met him and asked him whether he could give the people of Bangalore a "life in the Spirit Seminar" and he readily agreed, and it was held at St. Joseph of Tarbes Convent for the sisters. Then Fr. Fuster gave another seminar at Good Shepherd Convent, and after which Fr. Rebello was carrying on with regular player meetings at Ashirvad. Fr. Francis Rebello, s.j. Founder-Director of St. Joseph's College of Business Administration, Bangalore, passed away in coimbatore on 6th january 1998. He was 68. Fr, Rebello, a former Principal of St. Joseph's Evening College and St. Joseph's College of Commerce, Bangalore, was closely connected with the Catholic Charismatic Renewal Movement in India. Funeral will be held on Wednsday 7, at St. Joseph's Seminary, Fathima Retreat House, Mangalore. In 1976. Fritz Mascarenhas, an officer on a Merchant ship, came to Bangalore after giving up his job. He had lived a very worldly life until the Lord touched his life through a Protestant Pastor and transformed him. He was a new person after his new experience of meeting the Lord and making Him the Lord of his life. Fr. Rebello invited him to give a retreat to the Commerce College Students, and the personal testimony and his preaching took the students by surprise. Slowly they got interested in the Charismatic Movement and it started to spread amoung college students. Fritz went to America for a short time, during this period Fr. Rebello was conducting retreats ad prayer meetings. When Fritz returned they teamed up again as the Movement began to grow strong. Once a month there was a Charismatic Mass and whole night adoration. Regular Group meetings also started functioning indifferent places. Mostly it was conducted in English which drew large numbers of which youth were the most. The Church in Bangalore was set ablaze by the Holy Spirit with the Gifts being given to the people. Young an old from various denominations attended these meetings which were held at St. Joseph's Boys' School hall. The hall used to be over flowing with people sitting on the floor, stage, window-sills and any place that could be occupied. The meetings were conducted on Thursdays and catered for the whole of Bangalore. The then Archbishop of Bangalore, Most Rev. Dr. P. Arokiaswamy, in a number of his circulars gave recognition and guidance to the Charismatic Renewal Movement, and appointed Rev. Fr. Francis Rebello s.j. as the Diocesan Director of the Charismatic Renewal of Bangalore. In 1979, a batch of Bangalore Clergy had a Charismatic Retreat preached b Fr. 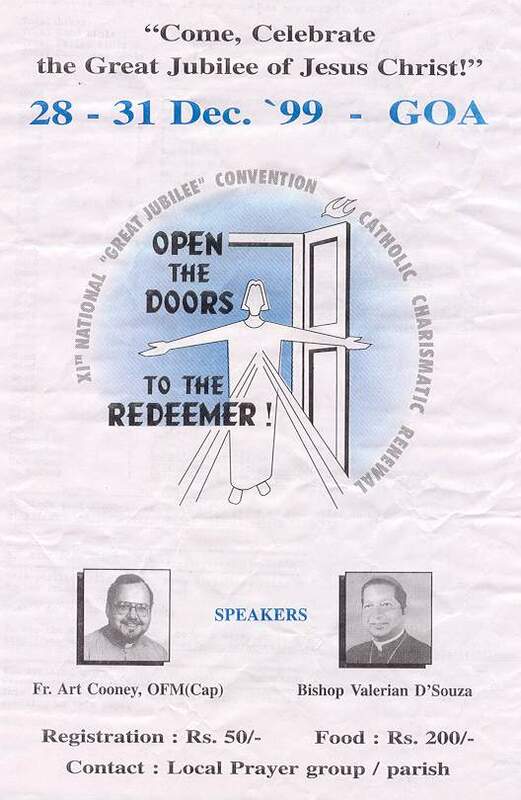 Rebello, and the IV National Charismatic Convention was scheduled to be held at the St. Francis Xavier Cathedral from 15th May 1980 to 18th May 1980. In the year 1982, the second batch of the Bangalore Clergy were given a retreat, and also another batch the following year. Thus the Archbishop encouraged the Renewal to take roots in Bangalore. At times the Archbishop would attend the Thursday Prayer Meetings at St. Joseph's Boys' School and encourage the Charismatics to be united to the mainstream of the Church. He would come to the meeting dressed in an ordinary cassock so that he could mix with the people and enjoy the power of God that flowed out at the meetings. The next Archbishop, His Grace Dr. Alphonsus Mathias is also a supporter of the Renewal, and encourages them to spread into the Parishes and channel the Power of the Holy Spirit to people who are not aware or were skeptics. His Grace Dr. Alphonsus Mathias has appointed Rev. Fr. Edward Cleary, C.S.S.R. as the new Diocesan Director for the Charismatic Renewal Movement in Karnataka. Now almost all Parishes have their own Prayer Groups, but the Bread of Life or "Thursday Prayer Group" functions as a gathering of all the groups once a week in a great communion of fellowship. St. Patrick's Church has its' own Prayer Group which is supported by speakers from various groups from around the City. It also supports the Healing Ministry on Saturdays between 4 p.m. to 6.30 p.m. at the St. Anthony's Oratory in the premises. Publications in Bangalore on the Charismatic Renewal was the "Charisma", this magazine has now been replaced by the "Alternative", run by the Renewal Youth. New Life in Jesus Prayer Group, functions at Ascension Church Parish Hall, St. Thomas Town, on Monday around 6.30-8.00 p.m.
Holy Ghost Prayer Group, which functions every Tuesday around 6.15-7.30 p.m. in the Parish Hall, Richards Town, Bangalore 560 005. The Word of God Prayer Group, functions at St. Anthonys Shrine, St. Francis Xaviers Church, on Wednesday around 6.30 - 7.45 p.m. Prayer Meeting at Christu Prabhalaya Church, Jayanagar on Wednesday at around 6.00 - 7.30 p.m. Prayer Meeting at Resurrection Church, Indiranagar on Wednesday at around 6.30 - 7.30 p.m. Bread of Life Prayer Group, functions on every Thursday around 6 p.m. This is the largest Prayer Group in Bangalore. At an average, more than 200 to 400 people come for the Meetings. This Prayer Group is basically catering to the floating population of Bangalore, visitors, support to other Prayer Groups. Prayer Meeting at St. John's Medical College, Koramangala, on Friday around 5.00 - 6.00 p.m. Prayer Meeting at Sisters of Lyons Convent, Kamanahalli on Saturday around 5.00 - 7.00 p.m. Youth Meetings:(a) Saturday at Mount Carmel College, Vasantnagar on 2nd & 4th Sundays at 3.30 - 4.30 p.m.
(b) Saturday at Ascension Church Hall, St. Thomas Town, on 1st & 3rd Sundays at 3.30 - 5.00 p.m. Prayer Meeting at Don Bosco, Lingarajpuram Church, on Tuesday at 6.00 p.m.